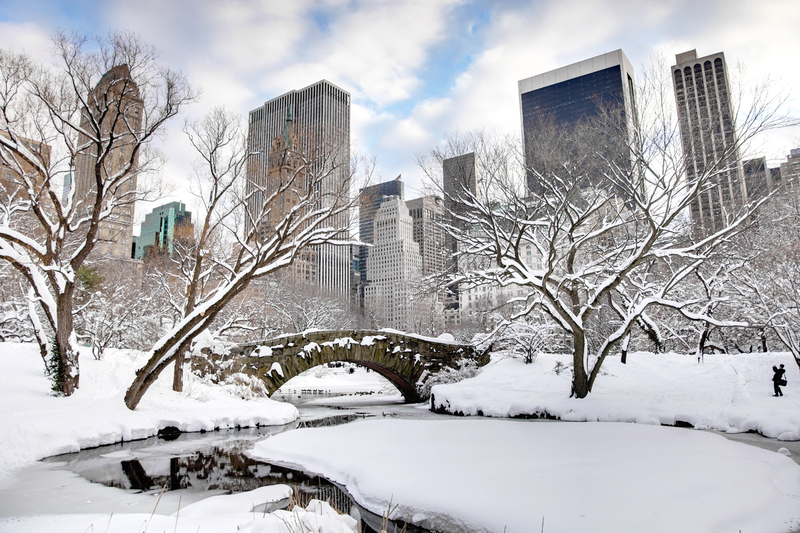 New York City may be coined the concrete jungle, but there’s no shortage of wintertime activities to enjoy—both indoors and out. Mark your calendar with these five festive destinations. Each winter, Rockefeller Center hosts a tree-lighting ceremony, free to the public. Soaring nine stories above the ground, the tree marks the start of the holiday season for New Yorkers and tourists alike. Although the ceremony has passed, the tree will remain lit and on display 5:30pm–11:30pm daily until January 9th. There’s also an ice rink at the base of the tree, so be sure to bring (or rent) your skates and hit the ice daily between 8:30am-12am. Buy tickets in advance to beat the crowd and reserve a spot now, as the rink can only hold 150 skaters at a time. Looking to warm up? Head inside the landmark for a tour of Rockefeller Center or to visit the onsite Concourse mall. The Winter Village at Bryant Park is also a festive wintertime event, featuring holiday shops, pop-up boutiques, and food vendors. The park also hosts the city’s only free-of-admission ice-skating rink. Throughout the season the rink holds special events, including synchronized ice skaters, ice-castle building, and an impressive tree-lighting ceremony. And if you’re bringing the kids, stop by the park’s famous carousel. Each year, over 100,000 people escape the city to Dyker Heights, a southern borough of Brooklyn, to view one of the most extravagant displays of Christmas and holiday lights nationwide. A Slice Of Brooklyn makes the trip from Manhattan easy, shuffling guests straight to Brooklyn via double-decker buses. Once on site, you can enjoy an informative tour from friendly locals, surrounded with holiday cheer from every angle. We recommend purchasing tickets early, as they sell out fast. The New York Botanical Garden Train Show is held each year at the Enid A. Haupt Conservatory, and zooms by 150 landmark replicas including the Empire State Building, Chrysler Building, Brooklyn Bridge, and Statue of Liberty. Select dates also feature an after-hours viewing paired with cocktails, beer, and wine. Stop at the visitor center to warm up around a fire pit, and sing along to the tunes of dueling piano players. The train show is open until January 25th, coinciding with park hours. Make sure to purchase your tickets ahead of time. Warm up and satisfy your sweet tooth with City Bakery’s February Hot Chocolate Festival, which serves up a new flavor for each day of the month. Some of last years' favorites included Babe Ruth, banana peel, peanut butter, and lemon. They also dish out sugary treats, so be sure to leave room for dessert. You can find City Bakery on 3 West 18th Street in the Flatiron District.